This week’s episode starts our journey to the top 8 of K-Pop Star season 5. Before we get into the competition, the contestants get a little makeover and do a photo shoot to prepare themselves for their future as superstars. If you guys aren’t familiar with the show, in this round the contestants randomly choose whether they’ll be placed in the A group or B group. Out of the people in each group, three people/teams will make it through to the top 8 automatically, while the other two are up for eliminations. 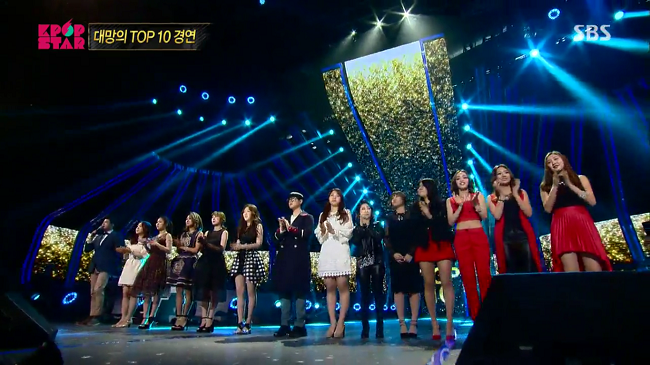 After both groups have gone, the 100 people audience will vote for one of the four people up for eliminations. The two people with the least amount of votes are eliminated. Before we start, can we just give props to the stage director. The stage was so on point tonight!